ZeroTwentythree: Ultraforge Giant Almost Done -- What's Next? I finished most of the details on the Ultraforge Giant. All I need to do is a few final touch-ups and the base. I tried to keep the colors of the accessories (clothing, etc.) on this one simple, in contrast with the brighter look of the Marauder Giant, and what I am planning for the Warploque Giant. 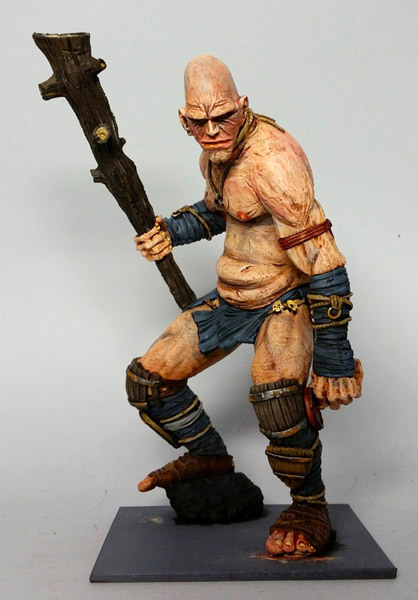 I'm really sort of stuck on how to base this guy and the Marauder giant. I don't want to get too carried away with a lot of extras, or make it look too far off my usual bases. But I'm also concerned with it looking overly plain. Terrain. I feel like I've got a really great start on a diverse terrain collection. It's also somewhat more relaxing to work on. Or at least differently relaxing, and especially good lately when I've been a bit under the weather. I have a big list of things I'd like to make, but I'm content to just work on it as I feel like it, without rushing. "Wave Three" of the rivers & roads, some bridges, more buildings, ancient ruins, trees, and a whole lot of other stuff. Marienburg. I think it's about time to return to the Marienburgers. While I do still have a lot of figures painted for this army (I sold some a few years ago,) I don't have the army I want. This is due to a shift in my gaming habit. In 6th/7th edition WFB, Empire swordsmen were a great buy. And in the context of the usual 6th/7th/8th gaming environment, every little advantage was important. Less effective troops were not worth taking due to the ultra competitive nature of popular gaming and Warhammer's focus on list-building. So I convinced myself to paint up a boatload of them as "sword and buckler men" and at this point that represents the dominant troop type in my Marienburg collection. However, I would really prefer pike & halberd troops. And I could really use some crossbowmen too. So maybe it's about time to paint those up. I've been starting to write out more notes for my own solo (or remote?) "Althammer" campaign, and have nailed the setting down to an alternate 2439 I.C., which is ten years after Marienburg secedes from the Empire, and about 80+/- years before the last "present" time in the Warhammer background, or at least when all of that End of Storm of Chaos Times nonsense started. So I've decided to keep the puff & slash landsknecht style troops as trend setting, fashion-forward mercenaries flush with gold from the burghers' coffers. But the remaining rural/militia/semi-feudal troops will have an appearance similar to the period just prior in the real-world (mostly mid/late 15th century, but since it's a fantasy game I'm not going to be too strict about that.) This will give me the excuse to make use of a lot of other figures I really like, plus still keep the landsknecht style. he is looking good. Also that list of future projects has me anxious to see progress on those. That Marienburg fluff idea seem pretty cool. It's partially just a rationalization so I can justify painting Wars of the Roses era figures as well as the later puff & slash. :) I have a few boxes of Perry plastics, plus some Front Rank lead that never got painted before I sold off my medieval Burgundian army.